You're sure to fall head-over-heels for the luxurious look of this living room group. Each piece features an elegance that is beyond explanation with details that are uniquely suited to its style. From tufted seat backs to shining nail-heads and decorative brads, this collection truly has it all. With show-stopping good looks, the Tiarella loveseat sets the scene for high-style living with Hollywood Regency flair. 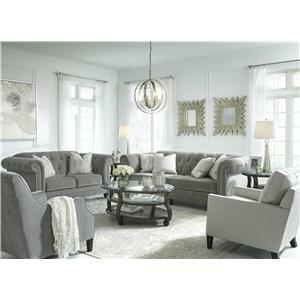 Lustrous button-tufted upholstery in a soothing neutral tone is easy on the eyes and pleasingly plush to the touch. The loveseat’s classic Chesterfield profile with dramatic roll arms is equally sheltering and sumptuous. Pair of satiny toss pillows only add to experience.